We apply adult learning strategies like andragogy to engage learners with activities and experiences. This approach fosters self-motivation, awareness of support materials, and emotional connection with instruction, which enable the development of new skills and knowledge. Our method ensures the collection of all relevant resources, the establishment of learning objectives and outcomes, and stakeholder buy-in. Our instructional developers use scenario-based learning methods to create activities that are relevant and engaging to learners. We make sure our interactions present plausible case information and encourage the learner to explore outcomes associated with different decisions and options. Through self-directed exploration, learners develop deeper comprehension and motivation to discover additional information by engaging with others on the subject. 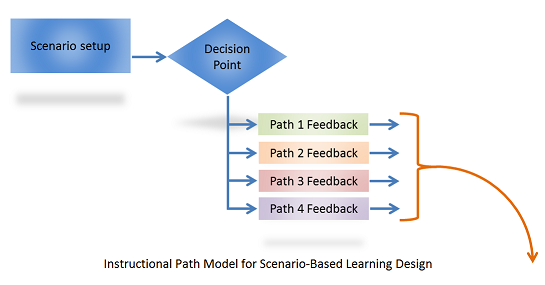 The image below is an example of an instructional path model used to visualize the flow of a scenario-based learning experience. Organizes and selects questions based on level of Bloom's Taxonomy (or other difficulty scales) and learning objectives. Allots students a set number of attempts to demonstrate competency at the various difficulty levels within each objective. Offers feedback that includes remedial materials and statistics on performance by level and objective. Tracks results for formative evaluation, a key aspect of the ADDIE model. We use assessments in a variety of ways to make our adaptive assessments as efficient and painless as possible.